Some days writing is more difficult than others. The blank page collects doodles of half-formed ideas. It begins to look like a list. I saw a red squirrel yeterday when I took a walk during a rare dry interval. I googled squirrel as spirit animal. The suggestion to avoid multi-tasking felt wise. The point about manifesting what is needed felt like a sneer. The exhortation to lighten up and play sent me straight off on another Google chase. Which led me to a Writer’s Digest list of 86 poetry forms. The write up on Erasure or Blackout poems seemed kind of playful. So I dove into the paper recycling and hauled out some magazines. I only had a blue marker to black out text. 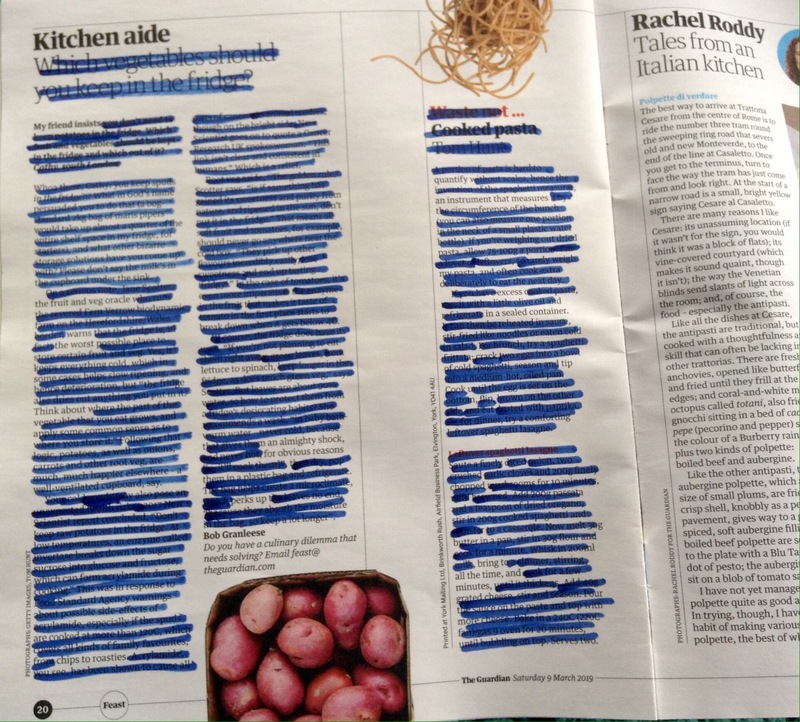 I did a very random pick and fished out the March 9th issue of Feast, the cookery section of th weekend Guardian. This is how it looked at the end my blacking out session. There is a long tradition of Ars Poetrica contemplationson the art of poetry. I have been cogitating about this in a kind of brew and stew sort of way a lot recently. Partly, it is because I have been asked to write an article about sacred poetry. The other part is that I am preparing several workshops, including one dedicated to poetry writing next Sunday. What is the common denominator beyond form and content? For me, poetry is connection. I went to sleep with this sputtering in my subconscious and the first verse of today’s poem was beginning to be formed as I was waking. So, here I am doing my poetry practice, sewing frayed seams. on the national holiday weekend. It’s slightly ironic that I chose this featured photo as I got lacerated this morning trying to intervene between two feline boys who are not taking being shut up indoors well. The little black she cat is the only one with any respect for me today. I started the day catching up on last weekend’s Guardian Review. I tend to read it piecemeal throughout the week and I am now at the back of the magazine and happened on Jonathan Freedland’s essay on the Post-Truth era. This sent my mind skittering to the Keats poem and the oft quoted “Beauty is truth, truth beauty” from his Ode to a Grecian Urn. As it turns out, after a quick Google search, it seems that Keats wrote the poem in May 1819. It was published anonymously in January 1820. So we have a nice bi-centennial up for consideration. Today’s poetry practice did a bit of digging via Google and Wikipoedia (what we rely on in the post-truth era) for some context. Keats spoke that truth was beauty. on the human auction block. were Keats' models for his ode. Image sourced from Wikipoedia. A tracing done by John Keats.